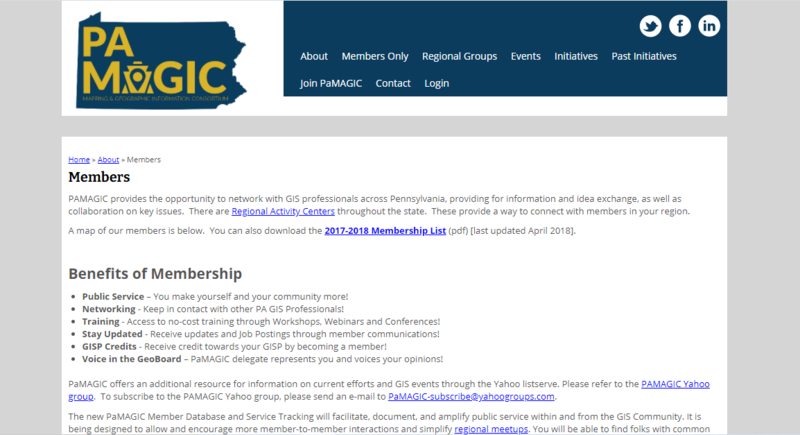 The Pennsylvania Mapping and Geographic Information Consortium (PaMAGIC) is a non-profit organization serving geospatial professionals in the state of Pennsylvania. The organization had a vision to develop a new website that would allow access to members-only content, as well as allow members to search the membership database. To achieve these goals, the organization took over management of their website. As I was serving on the board during this time, I was assigned as the project lead. The major steps were transferring domain name ownership, purchasing a web hosting plan, and developing a new site on the Drupal platform. The redesigned site is responsive and currently allows for members-only content. Additional functionality is being developed on a test site, and then ported over to the live site. My ongoing responsibilities include administering the website (updates, users, etc.) and developing new functionality.